CCA Kids Blog: Wonder Wednesday: Wonder Lesson Plans and Resources Galore! Wonder Wednesday: Wonder Lesson Plans and Resources Galore! Thank you to Carolyn Johnson, and her awesome daughter, and former CCA Kid, Jennifer. They have been producing the long-awaited Wonder lesson plans. Lesson 1 is complete and the rest will be available soon! Make sure you stay up to date on their availability by reading our monthly e-newsletter. You can request Lesson 1 now by contacting us. Teachers and parents, you can read the book Wonder and turn it into an impactful, classroom experience. CCA offers lesson plans, great for groups and classes to get an even more in-depth understanding of the messages held in R.J. Palacio's New York Times Best Selling Novel. Beyond the lesson plans, you can also purchase more fun Wonder-related products from our webstore. 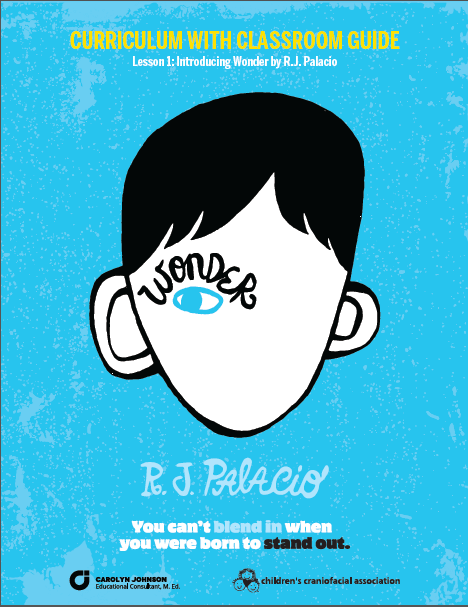 Go ahead and get a CCA Choose Kind Challenge Poster, the latest CCA newsletter and brochure, a Choose Kind Flyer, and information on how to connect with a real-life Auggie Pullman, the protagonist of the book Wonder. Contact Annie Reeves at areeves@ccakids.com to get more detailed lessons plans. Check out additional free resources on the Wonder page of our website.